The specimens shown at right are hanksite. 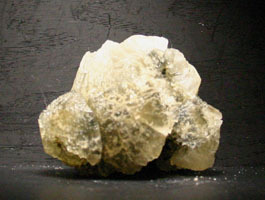 It is an evaporate mineral from the Searles Lake area near Trona, California. 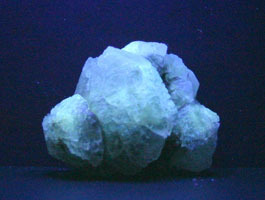 Hanksite does not fluoresce under short wave ultraviolet lighting and we have therefore, chosen not to include a photo under that lighting. 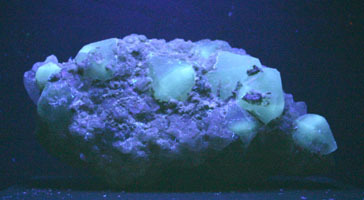 Under long wave you get a greenish blue fluorescence from the hanksite. The purple that you see is the reflection of the long wave fluorescent lights off the light colored matrix of the specimen. 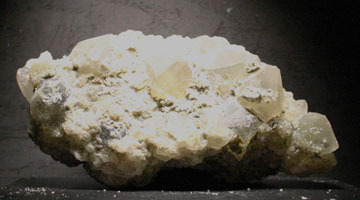 Since the specimens are an evaporate mineral, they cannot be cleaned with water (it would dissolve them). Instead, when the surface becomes dull, a light coating of mineral oil should be applied.